1. 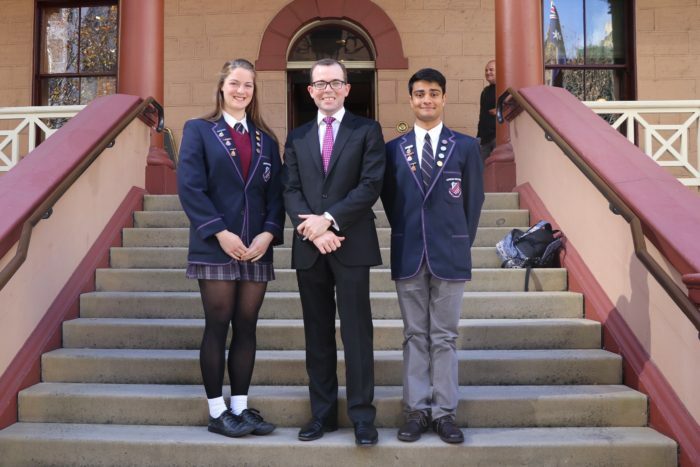 Northern Tablelands MP Adam Marshall pictured on the steps of State Parliament last week with Armidale High School captains Georgie Cooper, left, and Subhanu Abbaraju. 2. Northern Tablelands MP Adam Marshall pictured on the steps of State Parliament last week with Duval High School captains Zoe George, left, and Stewart Browne. STUDENT leaders of Armidale and Duval High Schools got a taste for NSW politics last week during a tour of the oldest Parliament in Australia. Northern Tablelands MP Adam Marshall played host to school captains Georgie Cooper and Subhanu Abbaraju (Armidale HS) and Zoe George and Stewart Browne (Duval HS) during a Secondary Student Leadership Program, conducted by the NSW Parliamentary Education Branch, which included a visit to Government House. “This program provides students with the opportunity to meet their elected representatives and to develop their knowledge of constitutional and parliamentary proceedings including the role of the Governor and the workings of the Parliament,” Mr Marshall said. “Georgie, Zoe, Subhanu and Stewart were exceptional ambassadors for their schools and the Armidale community. Mr Marshall said the student leaders, together with their colleagues from schools across country NSW, began the day listening to addresses from MPs before quizzing them on the life of a politician. “As Parliament was sitting, the student leaders also had the chance to view both Houses in action before heading off to Government House to meet His Excellency the Governor,” Mr Marshall said. “The program was a great opportunity for the students to develop their knowledge of constitutional and parliamentary proceedings including the role of the Governor and the workings of the Parliament.